CAMERON Smith's record breaking match has ended on a sour note with a sickening injury to North Queensland winger Nene Macdonald. It was 16-12 to the Storm with just over five minutes left when Cowboys stars Macdonald and John Asiata collided, tackling Storm winger Josh Addo-Carr on a kick chase. The pair lay sprawled on the turf with Cowboys trainers and the team doctor running onto the field to tend to the downed players. The collision appeared to cause an arm injury to Asiata while Macdonald suffered what Brad Fittler said was suspected to be a sickening broken leg. It was confirmed after the match Macdonald had a fractured dislocation. Controversially, the referees allowed the play to continue for more than 30 seconds. Fox League commentator Andrew Voss called the play being allowed to continue "highly controversial". "I know there have been changes but referees are not doctors," he said. "How do you assess how badly they are injured with two down?" The trainers were waving down the referees who refused to stop the game until Storm half Cameron Munster was felled kicking the ball, with the Storm awarded a penalty. Cowboys halfback Michael Morgan blew up at referee Grant Atkins. Atkins explained the ruling on the field to the fired up Morgan. That does not look good. "At the time, your trainers have to go to a touch judge and tell them you need a doctor on the field," Atkins said. "At no time in that set of six was I informed that your team has to stop." Morgan slammed the referees in a post-match interview. "He (Grant Atkins) explained the process around what happens if there is a player down and the process is the touchie has to be informed, but my question was that duty of care and common sense," he said on Channel 9. "From the players point of view when we have a doc, physio and trainer out there and there was two players down as well. I understand his explanation but there is a duty of care as well." 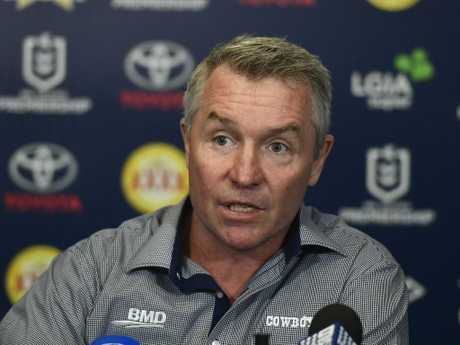 Cowboys coach Paul Green didn't hold back in the post-match press conference. "That was an absolute debacle," he said. "It was explained to our captain on field that the trainer has to go to the touchie. Our blue shirt was standing next to the touch judge asking them to stop the game, we had our doctor on the field, our yellow shirt when to the pocket ref and we got sent away. "It's an absolute debacle, it's a disgrace. We had a guy there with a fractured dislocation, clearly distressed and we get sent away. They stopped the game twice for a blood nose for god's sake when Melbourne had a blood nose. "Our player's welfare and safety was put at risk." Green said the players were very concerned about Macdonald in the shed but he said it didn't appear to be a compound fracture. Cowboys coach Paul Green was furious. The referees were the target of some scorn from the commentary box as well. "The only two people who thought that might have been the case were the referees because there was no one else that didn't think that deserved to be stopped," Braith Anasta said on Fox Sports. Macdonald's leg was bent the wrong way after the collision and he had to be stretchered off the field. It made a bad night for the Cowboys even worse, with forward Josh McGuire certain to come under scrutiny for an alleged eye gouge on Storm five-eighth Cameron Munster, in the 18th minute. Munster refused to make an official complaint on the field but television replays clearly suggested the fiery McGuire might have a case to answer. The evening had started well for the home side who scored early after fullback Te Maire Martin jumped on a Melbourne mistake in their in-goal and extended the lead in the 35th minute with a Jordan Kahu penalty goal. But the Storm machine finally clicked into gear coming up to halftime, centre Will Chambers running a perfect line to slice through the North Queensland defence and score. Captain Cameron Smith claimed rugby league's pointscoring record with a penalty goal from 15 metres out in the 49th minute. He slotted a further penalty goal late in the game to surpass Canterbury legend Hazem El Masri's record of 2418 points. From there the class of Melbourne was obvious with NSW State of Origin winger Josh Addo-Carr scoring a double to condemn the home team to their fourth- consecutive loss. Melbourne host the Roosters next Friday while the struggling Cowboys will leave Queensland for the first time this season to face the Warriors on Saturday in New Zealand.